I have to admit that when my neighbor asked me to join the new poker group she was starting, I had my doubts. The group was going to meet one Friday night a month, and I wasn’t sure I wanted to add another standing commitment to our already too-full calendar. Even more concerning, I was going to be the only member of the group who actually knew how to play poker, which meant it would be my job to teach everyone else how to play. My first inclination was to say no. 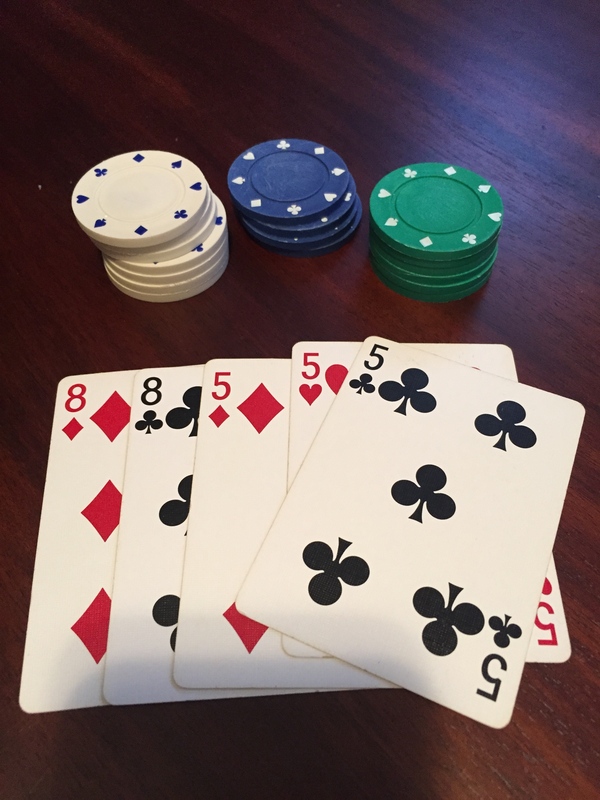 My second inclination was to say yes, and then explain that poker always has to be played for money, and that it was a good idea for everyone to bring their valuable jewelry and car titles so that they would have something to bet if their money ran out. (Did I mention I was the only one who knew how to play?) Luckily, I went with the third option, which was to agree to join the group and teach everyone how to play, and to play only for the little plastic chips that are handed out before each session. I do have a few finer instincts left. And so it goes…. But we muddle along, with me slowly learning to be a better teacher and the others slowly mastering the game. I suppose we might give up if the whole point of the evening was just to play poker, but of course, it isn’t. Between arguments about who is and isn’t allowed to “check the bet” we spend a lot of time talking and laughing, catching up on each other’s lives and just plain enjoying each other’s company. With every gathering, we are getting to know each other a little better. We feel comfortable telling the truth about our families, both the proud moments and the painful ones, knowing that we will get nothing but support in return. We talk about the things we’re happy we’ve accomplished, and the dreams that we are still hoping will come true some day. And in between the friendly banter, the serious talk, the eating and the drinking, and the occasional hand of poker, the evenings just fly by. I’m so glad that my neighbor started this group and invited me to be a part of it. I’m even happier that I didn’t decide I was too busy to join. Sometimes being middle aged means feeling that we are already doing all that we can do, and don’t have room to add more friends, more commitments, more new anything, and that’s a shame. Because there is always something new that is worth the time, if we are just willing to give it a chance. I took the risk on poker night, and that’s a bet that paid off, big time. Exactly! And at the moment, I’m learning how to teach people to play poker! But I’m also having a good time with some great friends…. Well, showing some hole cards with this post, Coleman. Upping the personality ante. Full house post. I thought about showing a royal flush, but thought that might be overkill. Thanks, Doug! What a fun thing to do! I have the same feelings of reluctance about committing to meetings or weekly gatherings, but I think I might change that attitude when I get back home. Sometimes making the extra commitment really is worth it, as I found out with poker night. Plus, it’s just fun to tell people I have a poker group! Thanks for the kind words!!! I remember walking into a casino poker room and realizing that no one was enjoying themselves. No one smiled. No one looked happy. Everyone looked like they were nurturing a compulsion. On the other hand, a neighborhood poker game is like pick-up baseball. It’s purpose is beyond the game. That’s why I hate casinos….I mostly see desperation, not happiness or fun. But as you say, friends or family playing poker around the kitchen table, is something entirely different, thank goodness! Especially when we’re just playing for chips. When I was a kid, we played for coins, but took them out of the family coin jar before the game, and put them back in afterwards, no matter who won. You have no idea how much self control it takes not to suggest betting real money…. Ha! Lol…maybe one day, but if that ever happens my guess is the game and company may not be as friendly. I recently decided I needed to make some new friends in the local area where we built our house. It is a risk to ask people to come together just to get to know one another and form deeper friendships because what if you get rejected or what if people don’t “click”? Some felt we needed a purpose – book study or current affairs discussion. I’m sticking with getting to know one another and hoping it grows into something meaningful. Every month as I send out a reminder, I worry yet again that my overtures will be rejected as a waste of time. What insecurities I have uncovered! Good for you to try to form a new group of friends! It does mean risking rejection, but I think its still worth the effort. The trick, I think, is not to give up. I joined a neighborhood book club, and I have to admit it took me a while to feel comfortable in it. But I stuck it out, and have gotten to know some of my neighbors much better because of it. Forming new relationships can be hard, no matter what our age. Hang in there! That’s pretty much how everyone who is first learning plays!